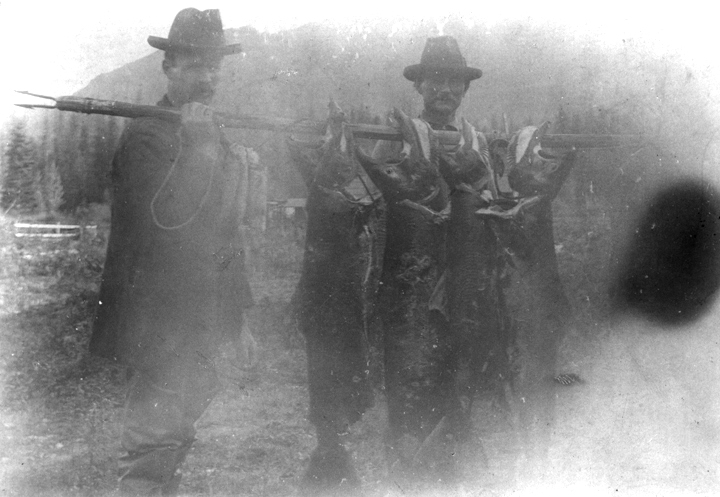 Catching Chinook Salmon in the Salmo River before the construction of the Grand Coulee Dam. The Salmo River has attracted people to its shores since time immemorial. First Nations once harvested as much as 70,000 lbs. of Chinook salmon annually from the confluence of the Salmo and the Pend d’Oreille Rivers. This opportunity was forever lost to the Upper Columbia and Salmo Rivers with the completion of the Grand Coulee Dam. Twenty plus years later, a First Nations band from the Colville area lead by Winslow and Homer Hall made their way up the Salmon River (renamed Salmo River) hunting, fishing and prospecting. The story goes that while sheltered under a ledge, the brothers watched a toad hopping away, and it paused on a rock that put a glint in their eyes. While hiding from the elements the brothers had found what they thought was copper, but turned out to be an incredibly rich silver and gold ore. This precipitous event brought world attention to ‘Toad’ Mountain, and gave us the Silver King Mine that essentially started Nelson, B.C., located just North of the Salmo River headwaters. Within two years, 10,000 miners arrived and the quiet Salmon River, as it was then known, was bursting at its seams. The miners opened up an area that produced the largest amount of gold in the entire British Empire from 1901 to 1902. For the next 50 years, the mining industry was a significant employer in the Salmo River Watershed with the forestry sector a close second. In recent years, both sectors have diminished in importance. Like many other formerly rich resource extraction areas, the Salmo River Watershed is in transition. There is a growing openness to new opportunities; but a common influence exists within our community, our love for the environment, The Place Where We Live. 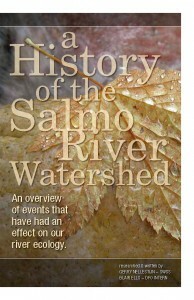 Download the PDF titled A History of the Salmo River Watershed: An Overview overview of events that have had an effect on our river ecology. Researched and written Gerry Nellestijn, SWSS, and Blair Enns, Fisheries and Oceans Canada, this informative booklet was completed in 2008.